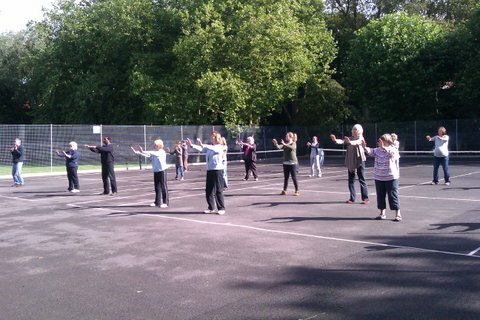 A few weeks ago when it seemed as summer would last for ever I joined a t’ai chi group in the park. It was late afternoon and people strolled up and formed ragged lines under the trees. The teacher arrived with his boom box (I’m not sure if that’s quite the right word). He turned it on and a mixture of Chinese music and birdsong rang out. Momentarily, our native birds seemed to be shocked into silence but they soon added their voices to their Chinese cousins. Mark, our teacher, started the group with slow qigong exercises. Moving all the time, teacher and class kept up a kind of dialogue. In between painting a rainbow, holding back the waves, cranes stretching their wings, was a casual discussion about gardens, apples and chocolate. People passed by on the path behind and they and their dogs stopped to watch and pass comment. This was not the purist t’ai chi I had been expecting but was all the more fun and more relaxing for it. Now the leaves are falling I have joined a morning class. There are seldom fewer than 15 people there, women and men, old and young. Chairs appear from the hut and the older ones like me can use them for support or respite. Mark always makes sure I can see the movements and is aware of his group in in a relaxed and good humoured way. Passers by are invited to join in and sometimes they do for as little or long as they like. I don’t usually enjoy organised exercise but there is something so easy and undemanding about being outside in different kinds of weather amid the comings and goings of the park which gives a great sense of connection. Make no mistake, I am sure t’ai chi is as energising and effective as any aerobic exercise. And, except for the tiny boom box, no technology is involved! Birmingham sponsors these classes and others under their Active Parks programme free of charge. For more information click on http://www.birmingham.gov.uk/activeparks. This entry was posted in exercise and tagged exercise, park, t'ai chi. Bookmark the permalink. I enjoyed reading about your adventures with T’ai Chi and hope the group will continue during the winter months! Thanks, Liz. I believe the park activities continue all year round weather permitting. There’s more information at http://www.birmingham.gov.uk/beactive if anyone is interested. If last week is anything to go by wrap up warm and wear gloves! If the link doesn’t work try google!